(From left) Fatin Nadhirah and Vice Chancellor’s Award recipients Law, Nurul Najihah and Wong after receiving their scrolls at the 16th IUKL convocation ceremony. 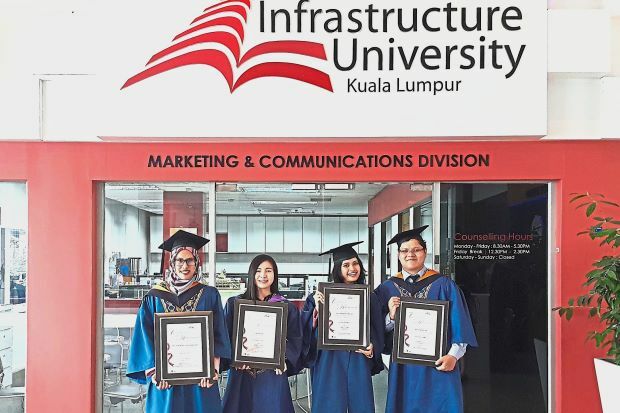 A total of 1,073 graduates received their PhD, Masters and Bachelor degrees and diplomas at the 16th Infrastructure University Kuala Lumpur convocation ceremony. The graduates, comprising five PhD holders, 42 Master holders, 727 Bachelor Degree holders and 299 Diploma holders, received their scrolls from IUKL chancellor Tan Sri Dr Wan Abdul Rahman Wan Yaacob and IUKL chairman Tan Sri Dr Hadenan Abdul Jalil at the ceremony held in Kajang, Selangor. Of the recipients, 74% were locals and the rest were foreign students from more than 30 countries. This year’s convocation also celebrated graduates from programmes in collaboration with Executive College in Sarawak and International College of Advanced Technology Sarawak (i-CATS). The Chancellor’s Award recipient was Fatin Nadhirah Muhammad Royani (Bachelor of Civil Engineering (Hons)) while Amos Wong Kah Chun (Bachelor of Electronics Engineering (Hons)), Nurul Najihah Abd Latif (Bachelor of Communication (Hons) in Corporate Communication) and Law Kah Yan (Diploma in Quantity Surveying) were the recipients of the Vice Chancellor’s Award. IUKL, which celebrates its 20th anniversary this year, has to-date produced more than 8,000 graduates who are now serving in the government and private sectors in Malaysia as well as abroad. They specialise in various fields such as engineering, business, education, communication, language studies, architecture, biotechnology and information technology.